Castelrosso is one of the most ancient styles of cheese from the Piemonte region of Italy. This venerable classic is also known as Toma Brusca, which roughly translates to “acid cheese.” The name comes from the process of letting the milk acidify slightly before cheesemaking, which brings out tart, bright flavors and creates a crumbly texture. The Rosso family has been making this cheese for over a hundred and twenty years, and their experience certainly shows! They use pasteurized whole milk from Pezzata Rossa cows, a breed native to the area that is well adapted to the mountain pastures. The milk from these cows is naturally more acidic, making it perfectly suited to the production of the cheese. 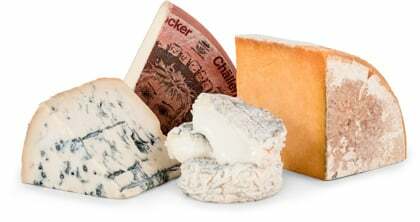 During aging, the natural rind develops an array of beneficial molds that ripen the cheese from the outside inwards. When perfectly aged, Castelrosso exhibits a winning combination of textures--the center is bright white and cakey in texture, with a bright, delicately tangy flavor and a hint of spice. Closer to the rind, the cheese is softer and funkier, with an earthy, barnyardy aroma and notes of sun-dried hay. The combination makes it an easy match for most beverage pairings, but it is particularly nice with Barbaresco, which comes from the same region. 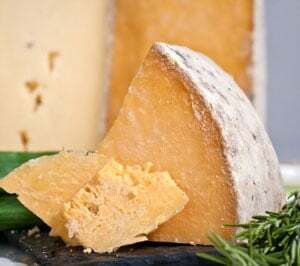 This pasteurized cheese is similar to an English style cheese like Lancashire or Caerphilly. You could think of it as an Italian version of a traditional English territorial cheese. The rind is thick and mottled while the paste is a lovely porcelain color. It has a mild buttery and tangy, lactic flavor with a very clean mouth feel. This is a cow’s milk cheese made with a natural rennet. It pairs wonderfully with condiments that have a bit of an edge like mostarda (a Northern Italian condiment made of candied fruit and a mustard-flavored syrup) or chestnut honey. The contrast between the soft, round flavors of the cheese pairs well with the sharper flavor of a chestnut honey. If any surface mold develops on the rind or the paste, simply scrape or cut it off and enjoy what’s beneath!